We were hiking at Cape Point a couple of weeks ago when I spotted a small white enamel bowl half buried next to the path. 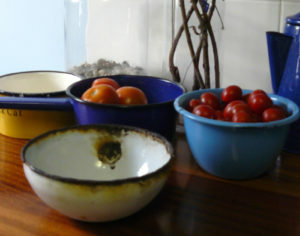 I love old enamel so put it in my rucksack and took it home. Although the rim was rusted away it cleaned up quite nicely and didn’t even have any holes! I decided to put it in a still life with an old jug that belonged to my grandmother. 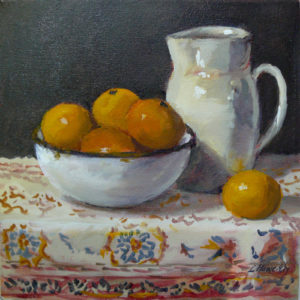 I filled it with naartjies (tangerines) and put the bowl and jug on an Iranian cloth. The painting is 25 by 25 centimetres. I really enjoyed painting this one; think it was the colours.